'KATE BUSH' in white in top center, white 'NE T'ENFUIS PAS' in bottom left corner, white 'UN BAISER D'ENFANT' in bottom right corner. Kate looks to her left, otherwise the same picture as the Canadian single 'Ne t'enfuis pas / Dreamtime', except that it is sharper and more orange. Black back. 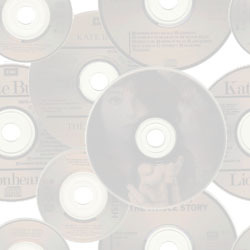 'KATE BUSH' in white in top center, white 'NE T'ENFUIS PAS' in bottom left corner, white 'UN BAISER D'ENFANT' in bottom right corner. Kate looks to her left, otherwise the same picture as the Canadian single 'Ne t'enfuis pas / Dreamtime', except that it is sharper and more orange. Black back. Yellow labels. Small breakout hole. From TSF box.